At Therapy Works, where Pookie goes for his OT and Speech therapies, they have a really simple style of visual schedule. It is one of those ideas that have you asking, “Why didn’t I think of that?” Well, here is the schedule strip. I made one for him to use here at home. Much easier than the yardstick idea that I had. 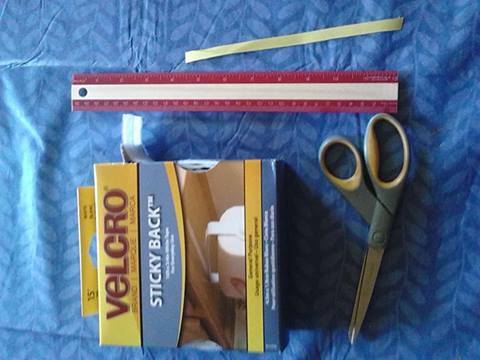 You only need 4 things to make the schedule strip: wooden ruler, self-adhesive loop tape (the fuzzy part of the hook and loop tape), a pair of scissors, and a length of ribbon. I cut a piece of the loop tape that was about 11.5″ long. 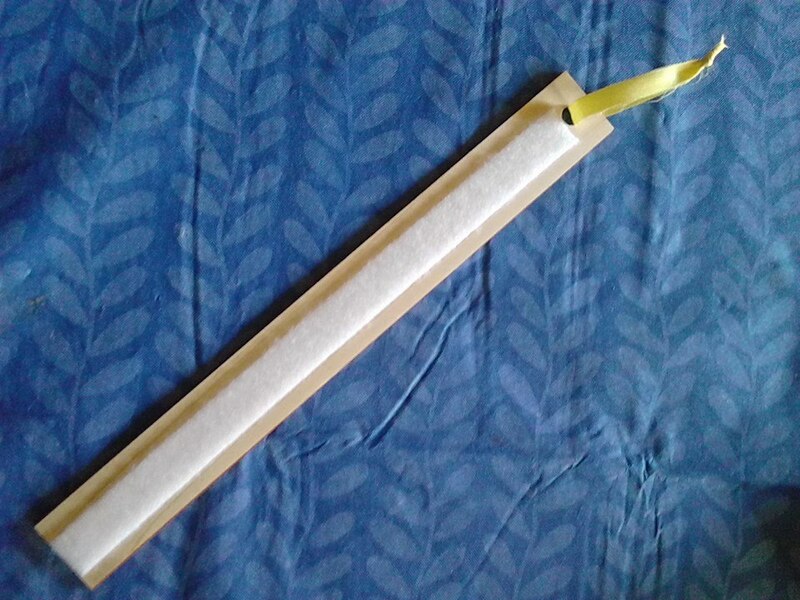 I adhered it to the back of the wooden ruler so that the hole near the end of the ruler was still showing. Next, I threaded a ribbon through the hole and tied it to form a hanging loop. That is it! Your child now has a very portable schedule strip to use. I am using this now for Pookie. I place his morning schedule on the strip. He has a little container into which he places the PECS cards as we do each activity. The PECS style cards that I have for his homeschooling are about 1″ square. You can easily make them on the SEN Teacher page I linked to in my last post. Just use your own graphics or ones found online through a Google Images search. You can also find them already designed on Pinterest. The website which I used to find the ones shown here are from Homeschool Creations. My son always amazes me. Often, he seems to be in his own little world. He doesn’t always watch what you are doing, yet he does take note of details. Today, Pookie was playing with some plastic eggs left over from Easter. It was a task that I had available to help with his fine motor skills. He picked up each egg, look it over carefully, then tap it on the couch before opening it. Once opened, he would lightly shake each half before setting them down. Consistently, he did this with each egg. I put the eggs back together for him and he went through the entire process again. Until now, I hadn’t realized just how much he paid attention to me when I cook with eggs. I always check the eggs over to be sure there are no cracks in the shell, thus causing the egg to spoil. Once I look the egg over, I tap it to crack the shell before pulling the 2 halves apart. Once I pour the egg yolk into the bowl, I lightly shake it to get every bit of egg white out of the shell. In his play, Pookie mimiced my routine for cracking eggs. This shows a great deal of attention and focus on details. It demonstrated a deeper awareness of what goes on around him – even when he seems completely unaware. It proves my belief that in reading to him aloud and getting him involved as I do the cooking and other household tasks, he is learning. He may be stimming and walking in circles, cut he does absorb what is going on around him. On Tuesday, we had a breakthrough with Pookie. I have been working with him from the very beginning. While we were awaiting the appointment to have him evaluated by the OU Child Study Center, I was researching therapy approaches. After reading about the various methods, I began using FloorTime with him. Sitting with him as he played and playing alongside of him. In the early days, he ignored me completely. He would sit there spinning his car’s wheels, seemingly oblivious to my presence. Over the months that followed, he slowly began including me in his play. I would imitate his behavior. He would stop his play, look at what I was doing, and then go back to his play. Sometimes, he would take my car and spin the wheels before giving it back to me. Tiny steps, but progress all the same. This interacting has gradually increased over the past 2.5 years. Now, he will play ball with others. Basically, he tosses it to you and you toss it towards him. He doesn’t attempt to catch it, but loves the game anyways. Most play is still done side by side though. He will watch as you do something or will sit near you and do his own thing. In recent months, I have been noticing that he is watching me a lot closer now. He is especially observant when I am preparing a meal. At first, I thought it was merely due to him wanting something to eat. I have come to realize that is not always the case. I began including him with meal preps. Sometimes, he will hold a butter knife with my help as I guide him in making his own peanut butter and jelly sandwich. Another time, he may pour an ingredient into a bowl for me or play with a bit of bread dough that I had pinched off the loaf I was kneading. On Tuesday, I was stirring a pan of ravioli on the stove. He cuddled up next to me and gestured towards the spoon. It has a very long handle, so I let go of the spoon and asked him if he would like to stir the ravioli. He held tightly to me with one hand and took the spoon in the other. As I held the pan’s handle, he stirred the ravioli. Later, he was watching as I cleared the table. He picked up his plate and put it in the dishpan without being asked. That afternoon, I was reading a book. Pookie brought a book over and sat next to me and looked at the pages in his book. He now follows me around quite often each day, constantly watching what I am doing. Sometimes, he will attempt to imitate me. Other times he simply watches silently. This has been the step forward that I have been looking for. With Pookie playing the “monkey see – monkey do” routine, trying to imitate what I am doing, the teaching can truly begin. Now, I can show him how to complete a TEACCH task and he will be more willing to follow the visual instruction. This simple step forward has opened up so many doors for us. Already, he is trying to use the Tap To Talk app on his tablet to communicate. We started with the simplest picture of a drink cup. When tapped, it says “I want a drink, please.” Whenever he wants to get a drink, I have him first tap the picture. Thankfully, there is also a picture for his favorite snack – popcorn! We are using that one also. Teaching Pookie how to complete new TEACCH tasks will be easier now that he is actively trying to imitate what I am doing. It is such a blessing that we have reached this milestone. It hasn’t been easy and it has taken a lot of time to get here. It gives me so much hope however. I now have one more thing to utilize in helping our son. I thank the Lord for opening that door for us.